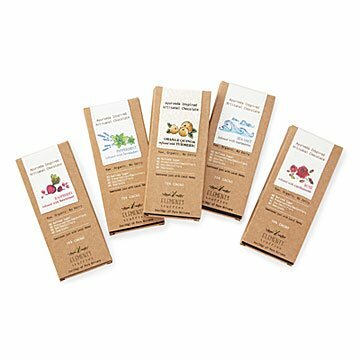 These small-batch chocolates are infused with superfoods said to balance the body's five elements. When stress can bring us to our melting point, a piece of chocolate can be just the thing to keep us together. As a former Wall Street trader, Alak Vasa found out about the sweet's super powers first hand and could count on the treat to lift her spirits on stressful days. Around the same time in her life, she was introduced to Ayurveda, a sister science to yoga that focuses on inner and outer wellbeing. Blending these two dimensions of comfort, her small-batch bars feature luxurious chocolate infused with superfoods that are said to balance the five elements of the body. Each raw, organic, and dairy-free bar is made from the finest quality Criollo beans from Peru and sweetened with honey harvested ethically from local apiaries. Handmade in New Jersey. Raspberry Infused with Beetroot: Beets are rich in antioxidants and essential minerals. Sea Salt Infused with Turmeric: A decadent and energizing combination. Peppermint Infused with Lavender: A relaxing and refreshing addition to your travel kit. Orange-Quinoa Infused with Turmeric: A bold and stimulating blend. Rose Infused with Cardamom: A mystical and restorative medley. On days when stress can bring us to our melting point, a good chocolate can be just the thing to keep us grounded. Alak Vasa would know: as a former Wall Street trader, she relied on the treat to lift her spirits. Around the same time in her life, she was introduced to the ancient science of Ayurveda. She discovered how balancing five intrinsic elements of our body could bring us back home—to a stable state of happiness, calm, and peace. Her small-batch bars blend luxurious chocolate with superfoods, blending these two dimensions of inner and outer comfort. The best natural goodness and a perfect present! Although I haven't been able to taste the chocolate bars myself, I look forward to seeing the look and reaction from my mom both when she opens them and bites into them. I was drawn to this product both because of the producers but also because of the superfood flavors. We'll see what happens! Flavorful and filled with love! I bought these at my yoga studio.. I purchased the sampler. Slightly pricey but I gave it 5 stars for a reason.. the instructions it came with, to bite it, let it sit, enjoy the flavor... Were so right. Really gives you the experience it's meant for, to balance and help you thoroughly enjoy the flavor. The way they're made, with no refined sugar, no dairy, I find incredible especially based on how great they taste. The combination of flavors are spectacular. The first one I tried was orange pistachio and turmeric. SO GOOD! Energized me mentally. I love the idea of lavender peppermint.. and i just tried rose cardamom. Will absolutely repurchase ALL of these. The idea of ayurveda as the inspiration for these chocolates really resonates with me. I think its a great way for people to be introduced to it, or if you live with that as a part of your routine, its a good way to enjoy life little pleasures while still maintaining your practice. 1000000/10. Should the creator of this product ever see this review.. thank you so much for being you and sharing this incredible idea with the world. < 3 much love. I bought them as a gift and she loved them. This fit her personality to a tee.